A desperate search for a safer life that all too often ends in death. Europe is seeing fewer migrants attempting to reach its shores, but the danger hasn't diminished. The death rate averages to a staggering six people per day, according to the United Nations Refugee Agency (UNHCR) in its annual report. 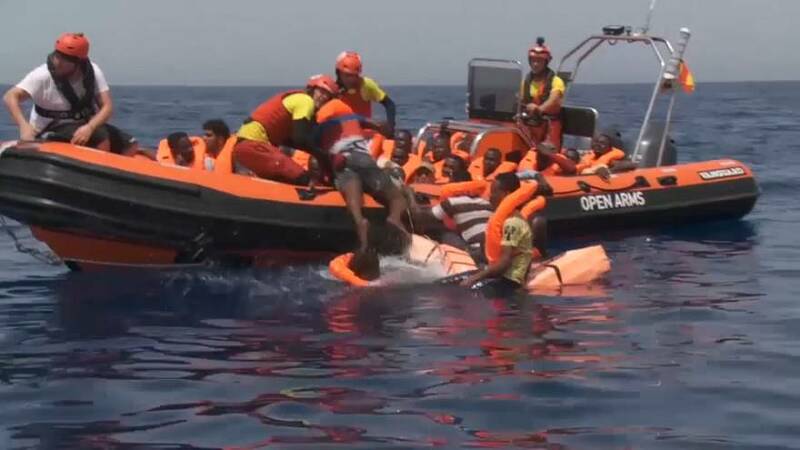 An estimated 2,275 died or went missing crossing the Mediterranean in 2018. Filippo Grandi, UN High Commissioner for Refugees told Euronews' Andrew Neil: "Actually between 2017 and 18, the percentage of those that we estimate having lost their lives has doubled, which means that there are fewer rescues. Leave aside every other consideration because I do fully realise the complexity of this problem. This is absolutely unacceptable, especially for Europe. And I speak here as a European not just as a high commissioner for refugees." The agency warned of a likely rise in anti-immigrant rhetoric ahead of the European Parliament elections in May even though the number of migrant arrivals in Europe fell last year, to a four-year low. Around 116,000 refugees and migrants arrived in Europe last year. In 2017, the figure was 172,000 and in 2016 it was 360,000. In 2015, it saw a million enter Europe when the continent experienced its largest influx since WWII. The report also reveals a shift in the routes being used. Spain is now overtaking Italy and Greece as the main destination for those setting out on both land and sea. The UN said it reflects a new political reality taking hold in Europe. Neil asked Grandi whether politicians thought if it was a crisis and whether they treated it like a crisis, for instance, Germany. To that, Grandi answered, "I don't blame Angela Merkel, who did, in my opinion, the right thing. [She] showed that Europe still put value in solidarity. But the problem with it was that when she made the famous statement that Syrians would be welcome in Germany, and let's not forget Syrians were fleeing an atrocious war at that time. When she made that statement the rest of Europe didn't follow, the rest of Europe didn't share that responsibility with Germany. She was left alone. That was the problem.